Warm from the pan and wickedly sticky with a rich chocolate topping, these homemade doughnuts make the ultimate naughty weekend treat. Bring milk to a simmer in a heavy saucepan. Dissolve yeast in 2 tbsp warm milk in a small bowl, then let stand for 5 minutes. Remove pan from heat and stir in sugar and salt. Put 350g flour in the bowl of a mixer with a dough hook. Pour in the milk mixture, 2 tbsp oil, yeast mixture and eggs. Mix until you have a soft dough. Add the remaining flour, then mix for 3–4 minutes or 6–8 minutes by hand. Transfer to a clean bowl, then cover and let the dough rise in a warm place until doubled in size – about 1½ hours. Turn out onto a floured surface and roll to 1cm thickness. Stamp out rounds with a 7cm cutter and cut out 3cm holes from the centres. Transfer to a floured tea towel, cover with another tea towel and let rise in a warm place for 30 minutes. Heat the remaining oil in a large saucepan to 190°C. Fry the doughnuts one by one for about 2 minutes each, until golden. Drain. Warm the cream in a pan. Place the butter and chocolate in a bowl and pour over the cream; stir until smooth. 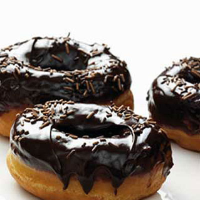 Generously drizzle chocolate glaze over the doughnuts and top with the chocolate sprinkles.